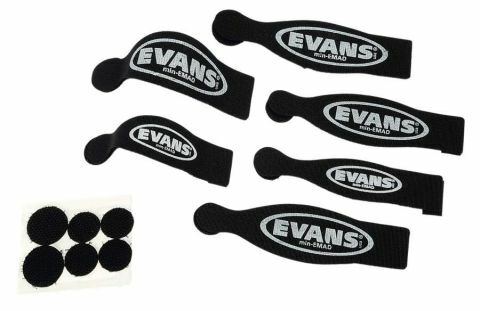 Evans Min-EMADS are not the quickest dampeners to tweak but after experimenting with the innovative straps, you'll be fine. Innovative and more sophisticated than most dampeners. Where other competition adopts a pretty uncomplicated 'stick it and see' approach to dampening, Evans adopts a slightly more sophisticated method. Its Min-EMAD is, obviously, part of the company's respected EMAD group of products, designed specifically to tailor tone perfectly - and it relies on an innovative Velcro strap and adhesive dots to do the job. It's a bit fiddlier to set up, and the Min-EMADs are more subtle than most products mentioned here, but repositioning and experimenting with them is easy enough.